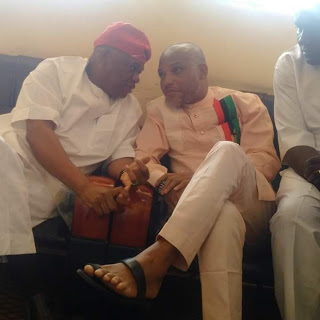 Former Governor Of Abia State and a Chieftain of the All Progressive Congress Dr Orji Uzor Kalu today visited the Leader of the Indigenous Peoples Of Biafra(IPOB) Mr Nnamdi Kanu at the Kuje Prison. Nnamdi Kanu had been on detention since September 14 2015 when he was arrested by operatives of the Department of State Security Services(DSS) over the activities of RADIO Biafra. Few Days ago Justice Nyako ruled that witnesses in the ongoing trial of Kanu would be allowed to testify behind a screen,a ruling which angered the detained IPOB Leader.